Waiting on Wednesday is a weekly event, hosted by Jill at Breaking the Spine. It spotlights upcoming releases that we are eagerly anticipating. "Honey is going to live with her dad in Australia. Determined to make a fresh start, she couldn't be further away from the tough times at Tanglewood. Her new life is a dream come true - until school begins. The girls are different from Honey's friends in England and the only person who seems to understand her is the cute boy from the beach she's chatting to online. But when he, the girls at school and even her dad start breaking promises, who can she trust? 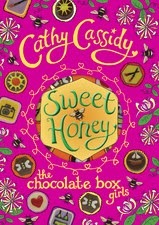 All alone on the other side of the world, Honey's past is about to catch up with her..."
Great pick! The cover is very festive. I havent heard of this one! Great pick! This is our WOW of this week. New to me, thanks for sharing! Here is mine. Feel free to leave your thoughts below: I read and reply to every comment! Copyright 2015 @ TeenBookHoots. Covers and abridgements are from GoodReads. Powered by Blogger.